The countryside is beautiful and well worth a considerably longer visit. 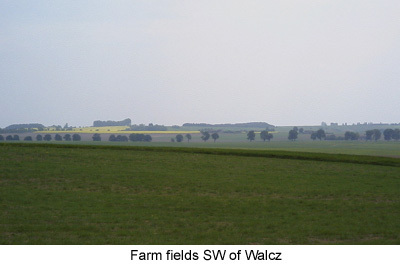 In the north the landscape looks very much like central Wisconsin, with sandy gravelly soil, green fields, timbered areas, and glacial hills and lakes connected by running streams. In the south the land is less hilly but still slightly rolling with occasional higher places. Productive farming seems to be everywhere but we were specially impressed with the fertility in the valley of the River Notec (formerly Netze) a major tributary of the Oder. The River Gwda (formerly the Kudde) flows south through the areas where the Zastrows, Klugs, Zellmer and Drews families lived and joins the Notec near Pila. Further south, not far from the banks along the upper reaches of the Oder (called the Odra in Poland), were several towns and villages where the Keils and Hillers lived.